The ERC-20 standard, first proposed in 2015, created the opportunity for anyone to easily create new currency/tokens on the Ethereum blockchain. The technology isn’t new. You could create tokens on Bitcoin using so called coloured coins. However, with ERC20 a standard was broadly agreed on and formalized, guaranteeing interoperability of tokens between applications and wallets. Interoperability was the key, allowing all wallets, exchanges and clients to operate with new tokens with no extra work. ERC20 quickly became the new standard for fundraising, with over 100,000 different tokens having been launched to date, and raising over $4Billion USD in 2017.The ICO boom has showcased the potential of the Ethereum network to act as a platform for the creation of novel financial instruments, and for the invention of new markets and possibilities. ERC20 Tokens have been used to represent shares in investments, to give users voting rights in dApp governance, to act as an internal currency, curation mechanism, participation requirement, store of value, and even as an everyday medium of exchange ($DAI). Fungibility is one of the key properties of anything aspiring to be used as money. It means any one unit is exactly the same as all the others. Anyone can trade theirs for others and they all have exactly the same value. Historically, the widespread acceptance of a fungible commodity marked the advancement from barter to currency based economies. A new concept being built on Ethereum are Non-Fungible-Tokens (NFTs for short). As opposed to ERC20 tokens, each NFT is unique and can be traded and tracked individually. While tokens are great for representing commodities, NFTs can be used to represent absolutely ANYTHING else. In typical Ethereum fashion, the first application using NFTs was a ridiculous internet-meme-era game about virtual cats. CryptoKitties is a collectibles game where you buy and breed virtual cats who each have unique “DNA”. This dApp is the most popular to date, and generated such a huge volume of transactions that it actually slowed down the Ethereum network in December 2017. 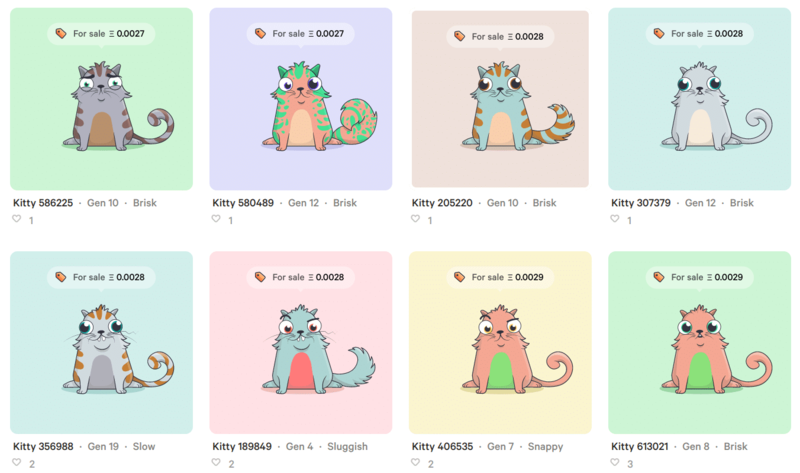 Cryptokitties was the first, but numerous clones have sprung up more recently, and all these so called “crypto-collectibles” can be discovered, bought and traded directly or through specialized marketplaces, for example opensea.io. NFTs are likely to have a huge impact on gaming, allowing in-game items to accrue value and be traded for real currency. ERC721 was the first standard. Newer Ethereum standards like ERC994 (Delegated Non-Fungible Tokens), and ERC998 (Composable Non-Fungible Tokens) are now adding new functionalities, allowing for new potential use-cases, markets, and disruption to emerge. ERC998 is particularly interesting, as it establishes the possibility for crypto-assets to own or be owned by other crypto-assets, including ERC20 tokens. This means you can bundle assets together, and transfer them together by simply changing ownership of the parent item. One use case which is particularly interesting is copyright and in general Intellectual Property. Licences for media/software. These could be registered as NFTs, giving them a virtual representation. The license could then be distributed through a “child” ERC20 token. Users could either buy at a set price, or this could increase when the item gains traction, using a more advanced contract like a bonded curve token contract. In 2009 Bitcoin introduced the groundbreaking idea of giving people direct access to money on internet without intermediation. However, when bitcoin evangelists talk about unbanking the banked, they usually refer to currency alone. The creation of non-fungible-tokens, and the emergence of crypto assets on the ethereum blockchain, will allow for the disintermediation of larger components of the financial system, creating new opportunities for the online economy to grow exponentially. Crypto brings together permissionless innovation and open financial markets. Non-Fungible tokens could allow any “thing” to be traded online. NFTs could be used to represent the deed for a house or a car, piece of art or an antique, or even a debt, liability or licence. This combination could potentially create very interesting dynamics, allowing price discovery, speculation, unbounded liquidity and automatic distribution of gains to investors. Any unique item can become a token and gain access to a boundless global marketplace with huge liquidity. This is one of the reasons Ethereum is now touted as the new Open Financial Market. While it is clear that crypto-native applications with virtual assets will be much faster to market, the opportunities provided by real-estate tokenization is clear, and countless startups are competing to build a legal bridge to allow smart contracts to manage real world assets. The most convincing approach I have seen in this space plans to use ”trusts” under South Dakota law. The possibility of representing this kind of high-value assets on Ethereum in turn allows for the holder of these assets to use them as collateral to get a loan administered by a smart contract. On the opposite side of the spectrum, this could also create crowdsourced mortgages, with the asset, represented by an NFT, held safely by a smart contract, automatically accounting for the monthly repayments, while also handling escrow and the final handover of the asset. Ethereum, and crypto in general, are showing us the explosion of creativity allowed by permissionless innovation and open protocols. Token engineering is still in its early stages, but the future is coming soon. Many bright minds are building on Ethereum, and in all probability advanced token structures will sooner or later take over the world of finance.